I can't take credit for the recipe for these amazing little bites of deliciousness. Alas, I wish I could. They turned out great. I actually had bookmarked the recipe months ago with the plans of getting around to trying them eventually. But I had never had Mexican chorizo (we grew up eating Portuguese chouriço and there is HUGE difference), so I just wasn't sure. Fast forward to a few weeks ago when my sister said she wanted to try a recipe from Mark's Daily Apple that used Mexican chorizo. We bought some and then it was gone before I even had a chance to try it. So last week when I went shopping and some chorizo caught my eye, I had to try it. So my first experience with chorizo was Chorizo & Egg Pepper cups; they were delicious (that recipe is coming soon), and I was sold on chorizo. This meant that I now had some extra chorizo that I needed to use up. And I've been thinking lately that I need to eat more vegetables. Luckily, I remembered this recipe; it calls for approximately 3 links of chorizo and that's exactly how much I had left. This had to have been something like fate. 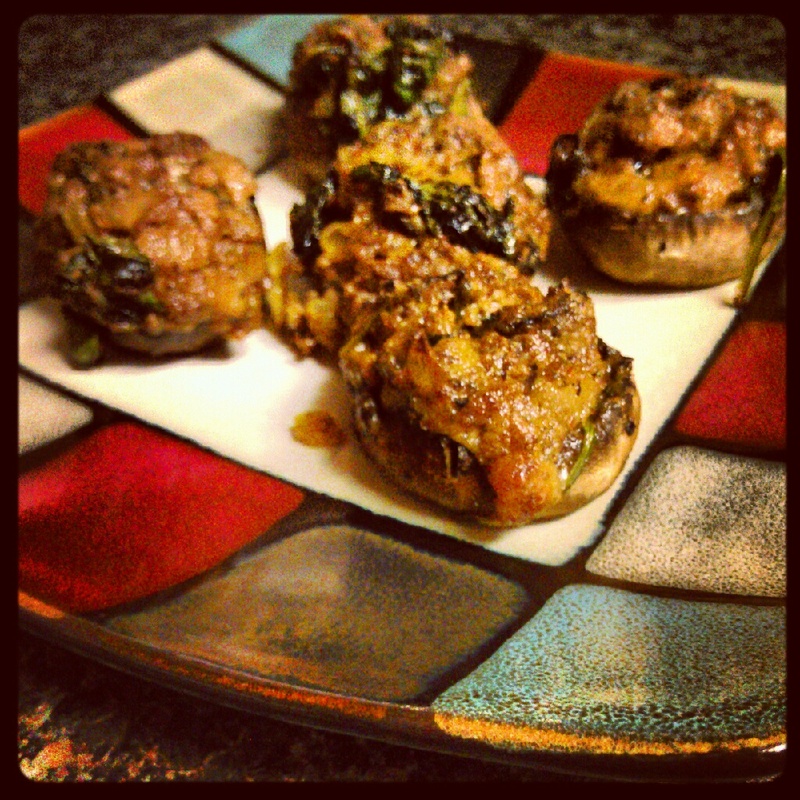 I hollowed out the mushrooms and added the scraps and chopped up stems to the skillet with the onions. I don't frequently cook with mushrooms and can't stand to throw away good food, so I felt like this was a good option. When the oven was preheated and the filling was still cooking on the stove, I popped the mushroom caps in the oven for about 5-10 min until they looked slightly cooked and then dumped the liquid to prepare them for filling. I don't care to use to the microwave for cooking if I don't have to, and the oven was already preheated so I feel like this wasn't any extra work. I added a couple more tablespoons of manchego and an additional ounce of cream cheese to the filling. This meant that I ended up with a little more filling than mushrooms, but I'm not complaining. I'll find a way to eat it. After cooking at 375°F for 10 min, I turned the broiler on high and stuck them underneath it for about 3-5 min. This made the top of the filling a little bit crispy, which I prefer. A big thanks to I Breathe... I'm Hungry. 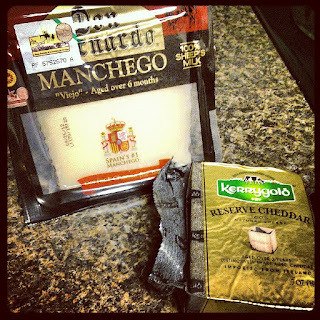 Because of this great recipe I have also discovered a great new cheese—manchego. Manchego is actually made from sheep's milk instead of cow's milk. The brand I found was a little bit pricey compared to some cheeses, but it was aged at least 6 months (aged cheeses are usually preferred; and according to Wikipedia, all official manchego cheeses labeled "viejo" should have been aged at least a year) and tasted great—definitely a new flavor. While looking for manchego, I also discovered a great deal on some grass-fed cheddar cheese aged 2 years. I tried a bite of this one tonight also; it was a little pungent (similar to Swiss) for a cheddar cheese, but I enjoyed the flavor. Here's an additional photo of my cheese splurge.